Here's A Full Look At The Upcoming Concepts x Nike SB collaboration! After countless teasing photos of the Concepts x Nike SB collaboration, we finally have an official look at all three of the upcoming sneakers! Notorious for creating some of the dopest collaborative designs in the game, Concepts has definitely brought their A-game for these three releases. Check them out below and let us know which is your favorite in the comment section below! Since foundation in 1996, Concepts has been built upon the skate culture. Continuing their long withstanding history with Nike SB, Concepts has teamed up once more to bring together their largest project to date. The Grail Collection truly meets the definition of a grail; an earnest pursuit, something that is sought after. The Concepts team was tasked with challenging their past work, and pursuing a collection that will rank among the most sought after Nike SBs in their archival history. The collaboration is made up of three sneakers in total, focusing on the Janoski Max, Nike SB Dunk High, and the Nike SB Dunk Low. With Concepts’ getting their start with Nike SB working on the Nike SB Dunk Low, the project comes full circle with the Nike SB Dunk Low being the prized “Grail” sneaker of the collection. Exclusive to Concepts, the sneaker features an iridescent upper that shifts color slightly as it catches the light. Complete with custom golden skull lacelocks, the sneaker also features a clear translucent outsole as well as custom branded insoles. The sneaker comes packaged in a bright, silver box with gold accents, and will also be available in two sets of limited edition packaging that are in­store exclusives for Concepts customers in NYC and Cambridge. The Hyperstriked boxes will be as below: Cambridge will be limited to 100 cement. Working on one of the latest models to the Nike SB line, the Janoski Max takes inspiration from mosaic tiling. With each piece meticulously hand laid, the mosaic process was extremely tedious process for ancient laborers. Blending faded pastels onto the upper, the sneaker replicates the cracking process of time­worn mosaic. As the sneaker is worn, the upper wears away revealing the pure white suede underlay, creating a unique design for the wearer. 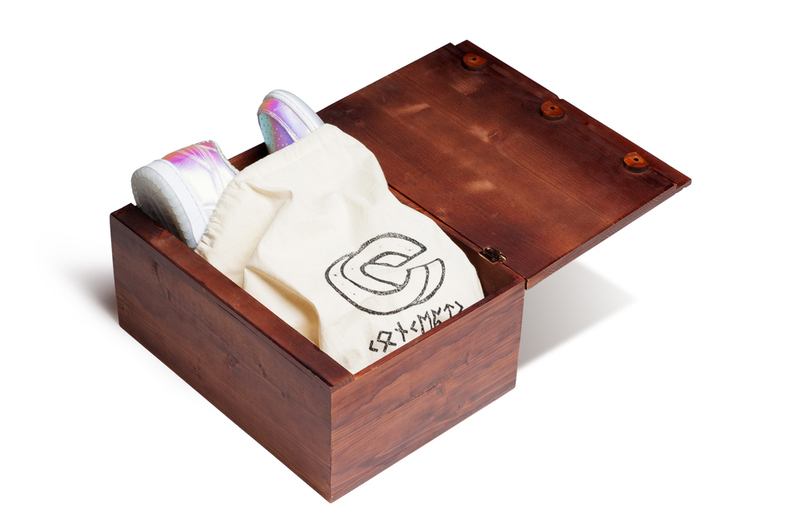 The sneaker comes packaged in a custom mosaic box exclusive to Concepts, and also features Stained Glass detailing in each sneaker footbed. The Mosaic Janoski Max will exclusively online at cncptsintl.com and in­store at Concepts Cambridge and NYC on July 25th. Replicating the beautiful stained glass art found around the world, the Nike SB Dunk High features a custom made stained glass print. The design pulls from techniques and styles over several centuries. Each pair is entirely unique, with no two prints having the stained glass design in exactly the same places. The process in making the shoe involved multiple steps of printed leather with textured clear overlays being bonded together to replicate the look and feel of stained glass.The shoe also features custom branded Concepts insoles, as well as a smoky­black outsole. Packaged in a matching custom box exclusive to Concepts the Stained Glass Nike SB Dunk High will release exclusively online at cncptsintl.com and in­store at Concepts Cambridge and NYC on July 25th.